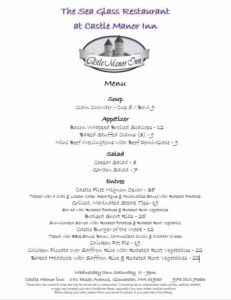 Sea Glass Restaurant @ the Castle is a charming getaway. Upscale cuisine by our Chef is paired with an atmosphere suitable for a romantic or formal celebration – or a casual family meal. Our indoor dining is comprised of 3 connecting dining rooms, each with a working fireplace, and each accommodating between 15-20 guests. Graced with antique wood pocket doors, each dining room can be closed off for a small private party, dinner or business meeting. An elegant Victorian side porch and a heated covered deck provides patrons the opportunity to enjoy the beautiful Cape Ann landscape. 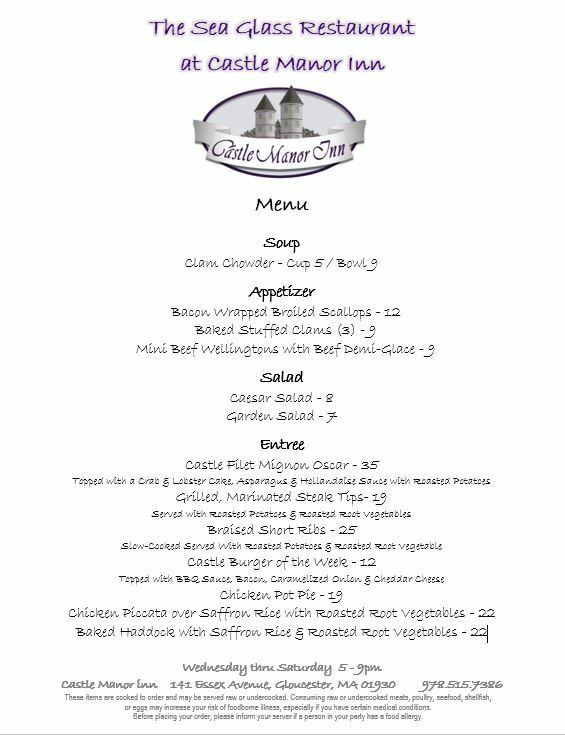 Executive Chef Dan Lavalla comes to the Castle with extensive experience in fine dining, large functions and especially seafood. 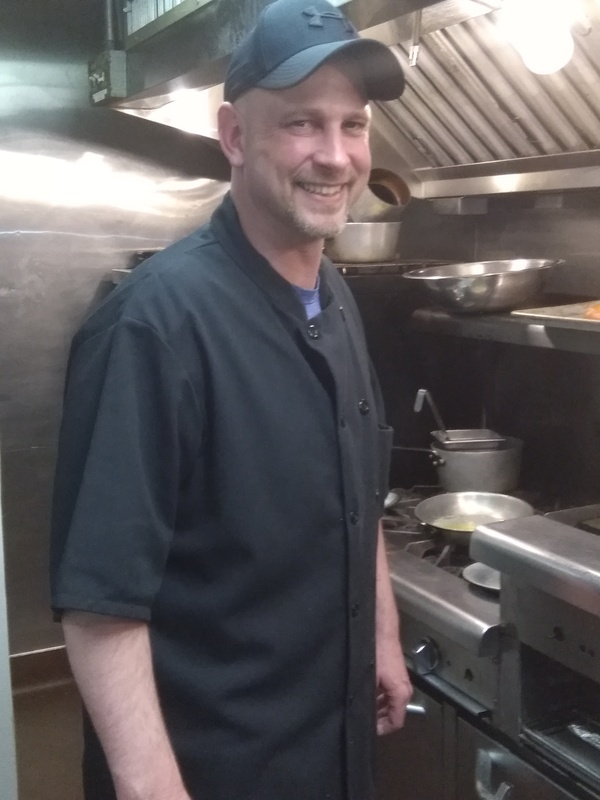 Before working with us here at the Castle, Chef Dan worked for many local restaurants for many years. Chef Dan is well known for his unique style and enthusiasm for food. His experience and knowledge of food and recipe preparation will bring new products and services to our patrons. He brings a wealth of knowledge and experience of food to the Castle with everything made from scratch. The experience, knowledge and excitement that Chef Dan brings to the Castle and, more importantly, to our patrons should make everyone excited. His creations are sure to delight your senses and bring joy to your meal. To celebrate the successful season’s bounty and harvest, The Sea Glass Restaurant at Castle Manor Inn has planned an amazing wine dinner on November 10th. 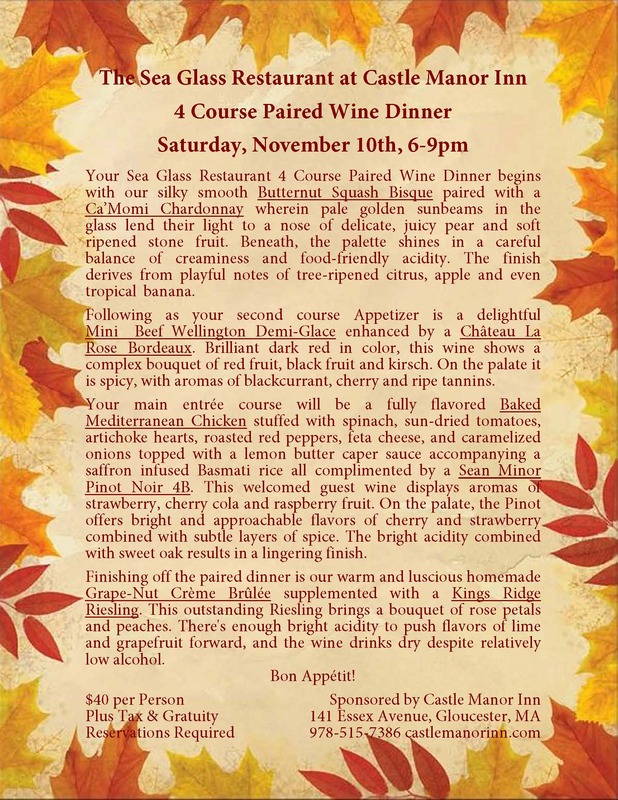 This Wine and Dinner event will feature wines of a different vineyard, country, or region with a perfectly paired menu developed by Executive Chef Dan Lavalla. $40 per person plus tax and gratuity. 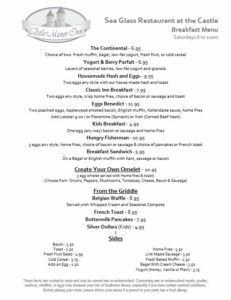 Reservations required 978-515-7386. 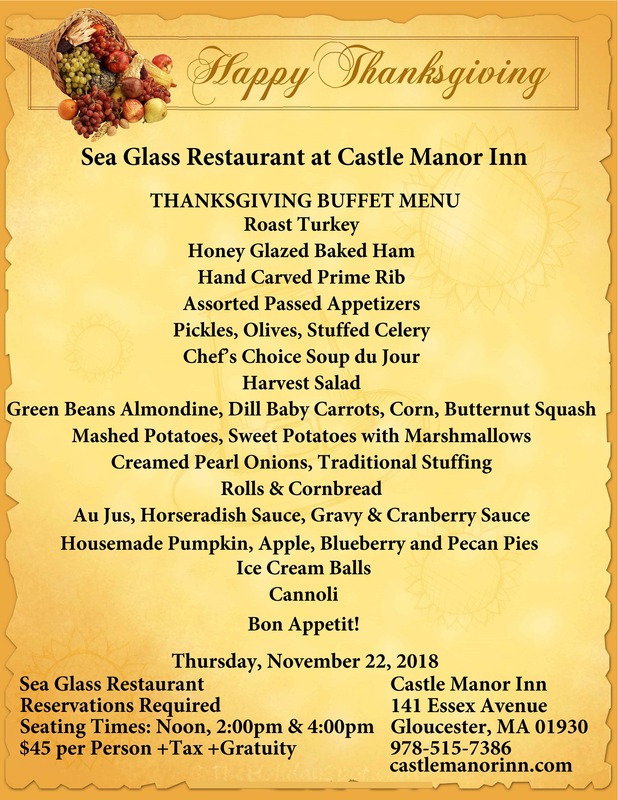 Sea Glass Restaurant Executive Chef Dan Lavalla, his Staff and the Castle Manor Inn pull out all the stops for its season-closing event, an elaborate Thanksgiving Buffet in the Sea Glass Restaurant at Castle Manor Inn. Gather with friends and family over an elegantly prepared Thanksgiving Dinner with the glimmering of candle light and glow of our fireplaces. 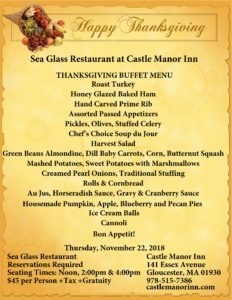 Join us on Thursday, November 22nd with 3 seatings starting at Noon for our Thanksgiving Buffet Feast, including classics like Whole Roasted Turkey, Honey Glazed Baked Ham and Hand Carved Prime Rib with all of the accoutrements, traditional and new, from assorted passed appetizers to delectable desserts. 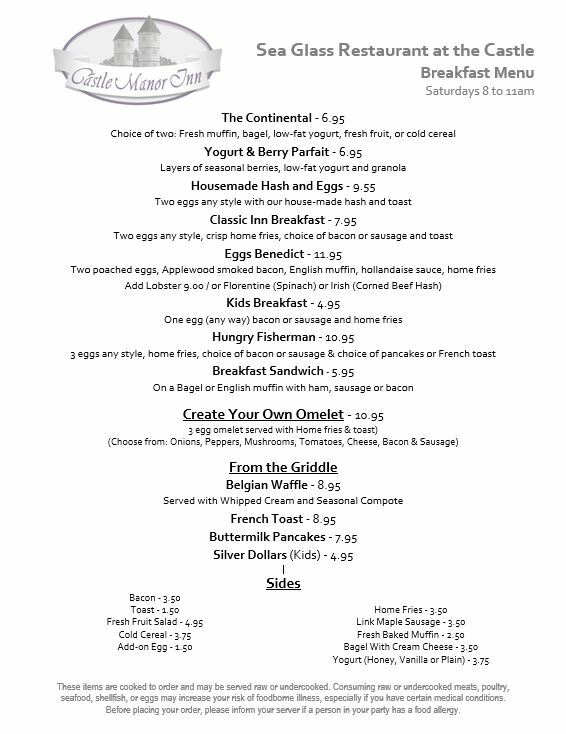 $45 per person plus tax and gratuity. We all wish you a very Happy Thanksgiving!